The XAFS beamline is dedicated to x-ray absorption spectroscopy. It is installed on a bending magnet and it is designed to cover a wide energy range: from 2.4 to 27 keV, allowing access of the K and/or L edges of all elements from sulfur to bismuth. Various collection modes and sample environments are available. The XAFS beamline thus meets the needs of a large number of researchers in the area of conventional x-ray absorption spectroscopy. Research ranges from fundamental physics and catalysis to materials science, nanotechnology and environmental science. X-ray absorption spectroscopy provides chemically specific short range structural information around the photoabsorber, in terms of the number and type of neighbors, interatomic distances and structural disorder. Analysis of the near edge part of the spectrum also sheds light on the electronic structure of the sample under investigation. At the XAFS beamline, spectra can be collected in transmission mode, fluorescence and electron yield. A liquid N2 cryostat allows low temperature measurements down to 80 K, a vacuum furnace allows high temperature measurements up to 2500 K. Liquid samples can be measured. 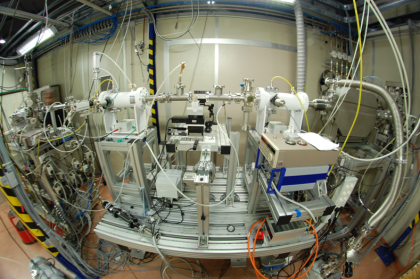 The beamline can be run in a completely automated mode for solid samples at room temperature in transmission mode. Detailed information can be found on the beamline’s main homepage.